President Trump speaks to the media at a news conference on the second day of the 2018 NATO Summit Thursday in Brussels. 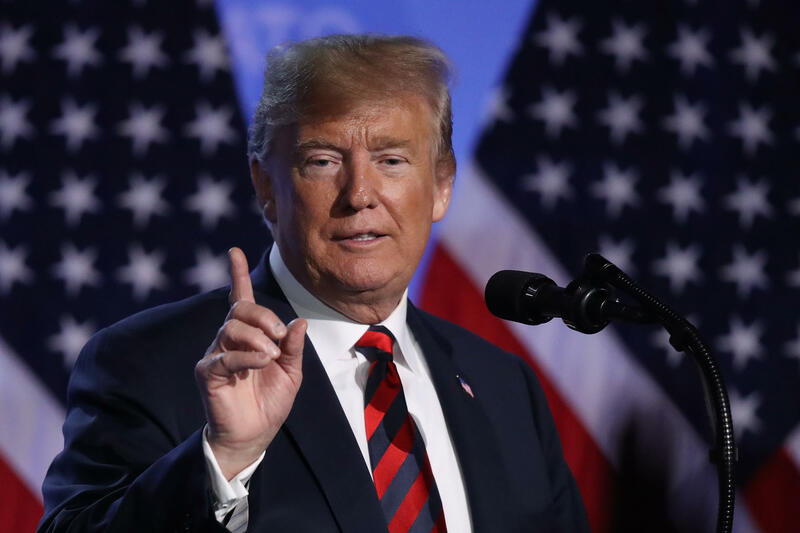 Not much had changed, but the answer to Trump's turnaround lies in three characteristics that shape Donald Trump's role on the world stage. Donald Trump promised to run the White House like a business, and that business appears to be a reality television production company. At the NATO summit, the conflicting statements, the dramatic last-minute news conference — not to mention the buildup over what Trump would say and do there — all added up to a dramatic arc. There was suspense, confrontation and then a hero appearing tough to vanquish his adversaries. "Remember the word '$33 billion more' they're paying," Trump said in his closing appearance. "And you'll hear that from the secretary-general in a little while. He thanked me, actually. He — he actually thanked me. And everybody in the room thanked me." Plus, there's a cliffhanger: Trump heads to Helsinki on Monday to meet directly with Russian President Vladimir Putin. "I think we go into that meeting not looking for so much," Trump said. But the Putin meeting has allies abroad and at home nervous. Trump said it could be the easiest meeting of the trip. He committed to raising election interference with the Russian leader, but when it comes to Putin, Trump is deferential — not tough. "So all I can do is say, 'Did you?' and 'Don't do it again,' " Trump said. And even though Trump downplayed his upcoming meeting, he compared it to his recent meeting with the leader of North Korea: "I think meeting with people is great. We had a great meeting with Chairman Kim." The meeting with Kim shook allies on another continent when Trump agreed on his own to cancel an upcoming military exercise with South Korea. Trump claimed victory for allies pledging "additional funds at a level that nobody's ever seen before." Before Trump was elected, NATO countries had pledged to raise their defense spending to 2 percent of GDP by 2024. This came after Russia's aggression in Ukraine, including the annexation of Crimea in 2014. It's something President Barack Obama even pushed for, complaining about U.S. allies in an interview with The Atlantic: "Free riders aggravate me." Trump said they had promised to do it faster than before, but French President Emmanuel Macron later said things were proceeding as planned. This is a similar outcome to Trump's meeting with Kim Jong Un. He claimed that Kim was going to denuclearize, when he had simply signed similar language to what his country had turned back on before — and then Kim reportedly continued to expand ballistic missile production. But in both cases, Trump had success by his own metric — as the hero of his own story. At the same time, NATO can claim a substantive success because Trump signed the communiqué coming out of the summit, including tough language pushing back on Russia; he also didn't pull troops out of Europe as he had reportedly considered; and he agreed to accept what NATO had already agreed to — and claimed credit for it. That was exactly what NATO allies had been urging him to do — take yes for an answer and then take a victory lap. While Trump was still berating allies, Republicans in Washington were joining Democrats to push back. The House and Senate passed resolutions nearly unanimously affirming America's commitment to NATO and deterring Russian threats against the alliance. "NATO is indispensable. It is as important today as it ever has been. We're reflecting that in a resolution that we're bringing to the floor today," said House Speaker Paul Ryan, R-Wis., on Wednesday. Even in Trump's own administration, no one was echoing the same kind of harsh rhetoric the president used. Bottom line: There is no anti-NATO caucus in Congress or the White House. European diplomats also speak of solid cooperation with U.S. diplomats, the Pentagon and members of Congress they meet. That being said, it's still really significant when the president of the United States says things that make the leader of Russia happy. Trump brought his aggressive destabilizing rhetoric to the NATO summit, even if catastrophe was averted at the end of the episode. European diplomats are feeling exhausted and disrespected after the Trump tornado came to town, but at least he hasn't pulled U.S. troops out of Germany. The season finale is coming up at the Helsinki summit on Monday, and we'll see whether Trump's behavior with Putin in person is as deferential as his rhetoric from afar. NPR's Arnie Seipel contributed reporting.